It is totally natural product. The down grows in the belly and neck of the goose, ducks and helps them to swim in frozen waters, keeping the vital temperature. The down clusters micro-filaments have a bigger elasticity than the best acrylic fibres, that sometimes make soggy leaving cold zones, whereas the down recuperates and moulds to your body. Each ounce of down contains near of two millions of interlaced fibres, that catch the air, keeping the heat inside and the cold outside. The goose down treated with the high recuperation system (high loft processes) guarantees a superior comfort and a big well-being. The meticulously selected down clusters, that we use and the most advanced present-day technology manufacturing processes ,that we apply, make Nordconfort to be able to offer the highest down quilts range of the market. 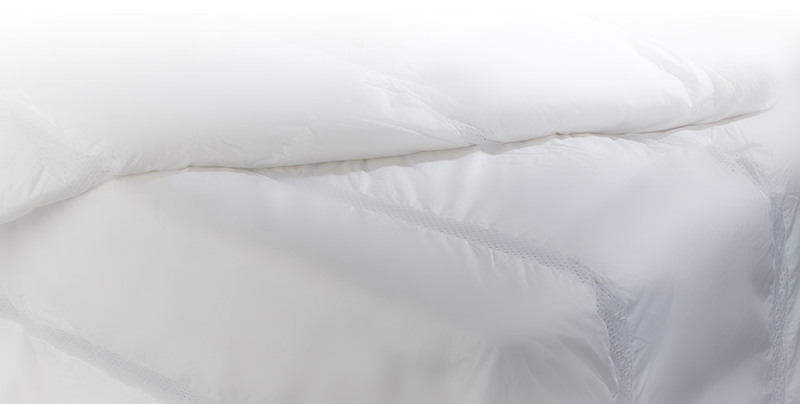 Nordconfort elaborates all its quilts with 100% cotton fabrics, this allows the down to transpire, providing heat and comfort. All the down quilts are confectioned with double stitching and are finished with piping. Regarding to the product care instructions, it is advisable to ventilate and to shake the product once a week at least, in order to distribute the filling, to keep in its cotton bag in a dry place without weight on it.